Hardness has advantages. I think of this today here in Michigan, where the temperatures have been so cold that snow absolutely crackles when car tires push over it. One must cover any exposed skin when going outside, and come back inside quickly. Time-to-frostbite is 30 minutes. Even the furriest living creatures need to hide. The trees long ago shed their soft, tender parts. Their bare branches, hardened for winter, tremor slightly in the brutal air. Flesh is vulnerable. Do I even want a heart of flesh? Yesterday I visited for the first time the Dice Mineralogical Museum on Calvin’s campus, a secret treasure room hidden in plain view down the main corridor of North Hall. This quiet escape, with its luxe, dark-wood-paneled walls and dim lighting, displays a spectacular collection of mineral specimens donated to the college by Bruce Dice, a geologist alum. It rivals what you would see in the best natural history museums. Hard things can be beautiful. Imagine Monet’s water lilies hardened into a perfect globe of rock—that was the ruby in zoisite, from Tanzania. The rhodochrosite from Argentina looked like poppies, flattened and sprinkled with sugar, baked hard in a jelly-roll pan. A calcite from Chihuahua, Mexico, looked like several bowls of cocoa puffs, clumped together and covered with frost. The cassiterite on muscovite, from Sichuan Province, China, was a cluster of gray guitar picks. The stibnite, from Jiangxi Province, China, a furious tangle of staples. These mineral crystals form from the basic elements of the universe, some common, some rare, under sometimes violent circumstances, over thousands or millions of years. And then they last. What could damage them? Even if you were to drop one, it probably wouldn’t even break. And if it did, it would still be beautiful in pieces. The comforts of the museum—the dim lighting, the controlled temperatures—those are for the human visitors. The minerals don’t care. They’re hard. It’s true they are not of equal hardness. The Mohs scale was developed to make comparisons. The pretty calcites and fluorites measure only 3 or 4 on this scale. Diamond, of course, is a 10. Even the lowly talc, at 1, is harder than flesh. However hard they are, they do not seem inert. 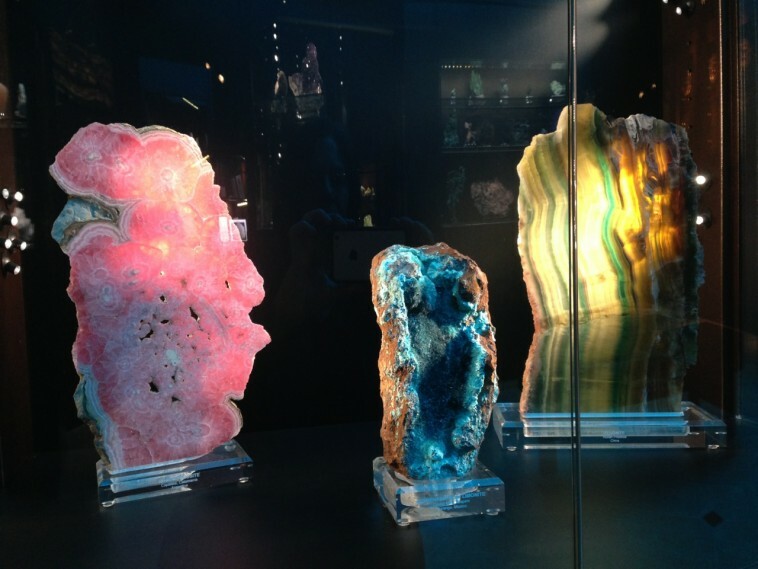 Poised in their brightly lit display cases, the minerals preserve motion. They look like oozing blobs, or skyscrapers in the midst of an earthquake, or folds of sparkling fabric. The “acicular” crystals are like hairs standing on end. Other crystals look like moldy fuzz. They’re weird and wild, and much more interesting, in my view, than the cut gem stones, artificial and tame, that typically occupy the next corridors in natural history museums. God seems to enjoy playing with hard things, with prismatic and tabular and drusy crystals, with vividly chestnut-colored vanadinite and eerie blue topaz. Hiding these rough wonders in caves, tucking them in layers of the earth’s crust, all over the globe, tossing them at earth from space. So if God is going to play with my heart, why not make it an amethyst geode? Coat it in a dull, rocky exterior, inside let it glitter, invulnerable? That’s because an octopus is so desperately soft—nothing but delicate tissue and tentacular streamers. Nothing but flesh. No wonder it had to turn to stone to leave any kind of trace. In a cold, hard world, why would I want a heart like that?